I’ve had awfully “good luck” ordering from d-dish.com in Portland, one of those restaurant home delivery marketing companies. Delivered Dish signs up restaurants, supplies backend ordering/menu software, and arranges delivery of restaurant menu items direct to your house for a small fee. They aren't the only ones or the creators of the concept, but they do a pretty good job at it as far as I am concerned. Most large cities have a similar service, and on a business trip to suburban Seattle recently, I checked out their version, 2 Go Services. I don’t know if there is any relationship between the Portland and Seattle outfits, but they do use the same “backend” and your sign-on will work with either service. In Seattle, we tried our luck with Vince’s Italian Restaurant and Pizzeria Pizza Renton, WA, a 50 year-old Italian restaurant and pizzeria. We ordered a pizza, the half/half pasta (ravioli/spaghetti) with a meatball, and accompanied by a side-salad, and an appetizer of cheese/potato croquettes. I had hoped to ‘surprise’ Mrs. Burgerdogboy with the croquettes, give her a little taste memory of her favorite junk food in Amsterdam, but the similarity ended with the name. In this instance, they are Vince’s Italian Restaurant and Pizzeria Pizza version of fried cheese sticks, and while good, they bear no resemblance to their Dutch namesake. No matter. The pizza, however, is one of my new favorites, and I’d order it again, given the opportunity. 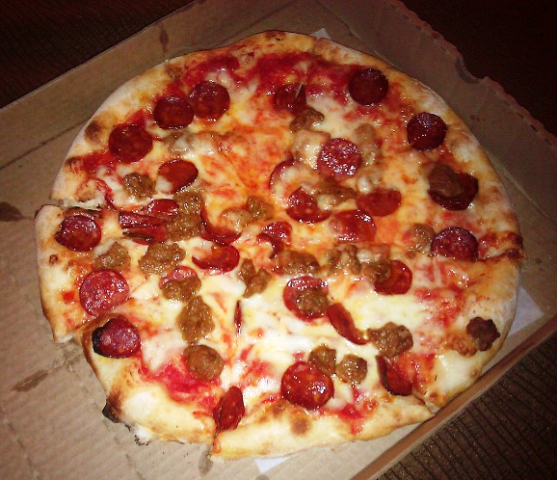 I went with a medium size sausage and pepperoni, and the crust was Neapolitan style, hand-made, crispy outee, chewy innee. The sausage was a similar recipe to the meatball, hand-pulled small chunks, and the pepperoni was small diameter thin-slices, with a nice smoky flavor. The entire pizza experience gave me the impression of “old-timey” pizza, and I don’t imagine the recipe or prep method has changed much in Vince’s Italian Restaurant and Pizzeria Pizza 50 years. On the “Worstpizza.com” scale of 1 to 8 slices, this is a solid 7. Even though it might not look like it is great, it happens to taste great.